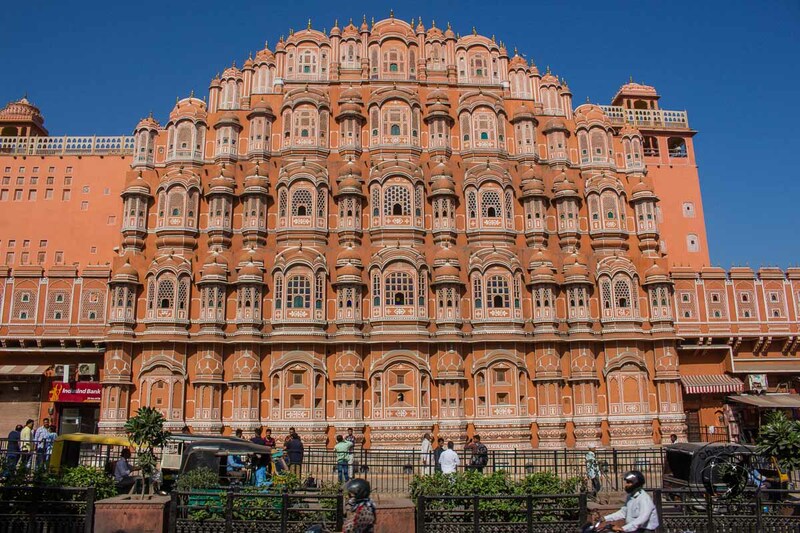 The Pink City of Jaipur is surely one of Rajasthan’s most popular stops, mainly because of the many important tourist places in Jaipur which provide visitors a deeper insight into Rajasthani life. 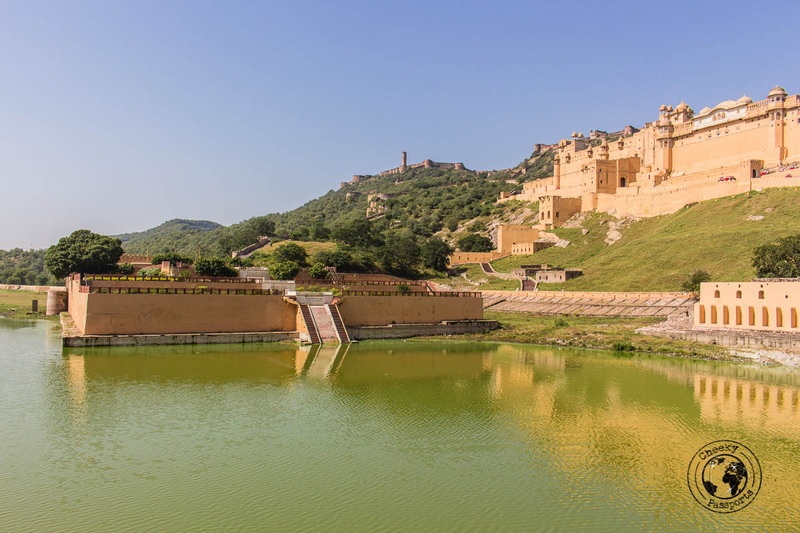 Home to forts, step-wells and palaces, among other attractions, Jaipur forms part of what is known as the Golden Triangle (which also includes Delhi and Agra), one of the most popular tourism routes of the country. 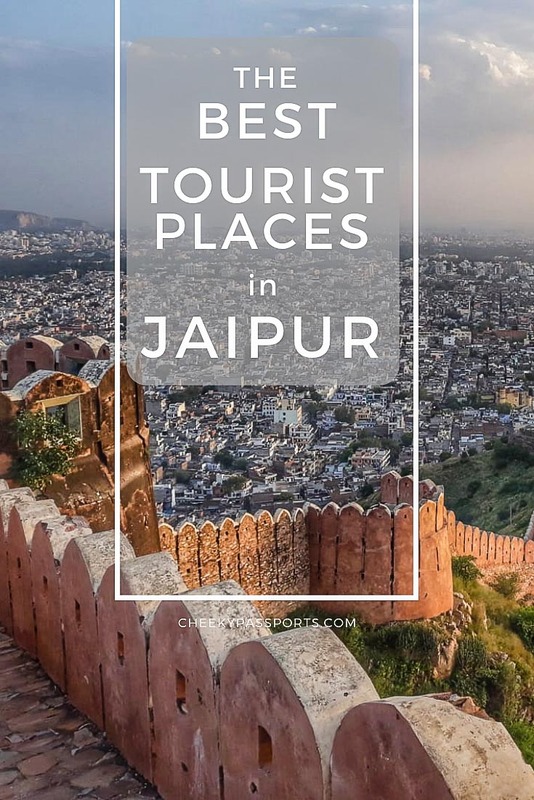 Many of the tourist places in Jaipur can be visited in two to three days, but if you have time, staying longer is a good idea – the desert capital is rather hot, and trying to visit too many points of interest at a go could tire you out very easily. Spreading out your sightseeing is recommended to prevent burn-out! 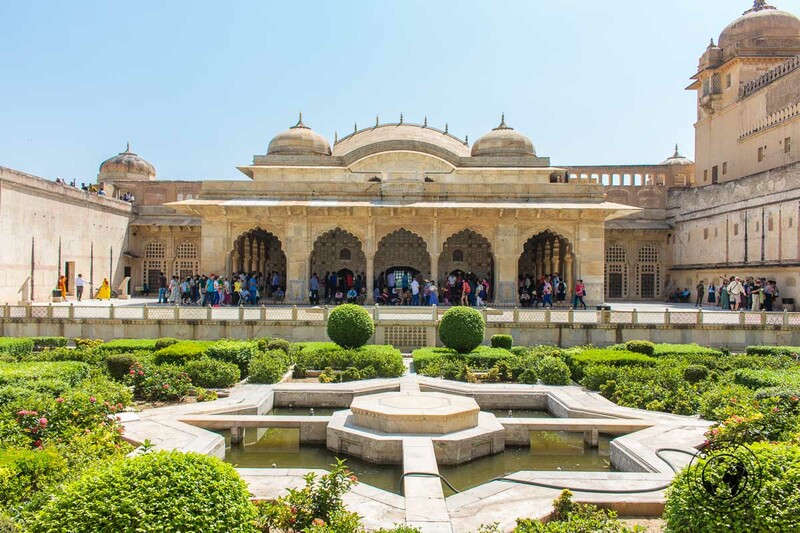 One of the more popular tourist trails for visitors to India leads to Jaipur straight after Agra, and then follows either to Udaipur or to other desert areas such as Bikaner, Jodhpur and Pushkar. Hence the Pink City can be easily included on many different itineraries! 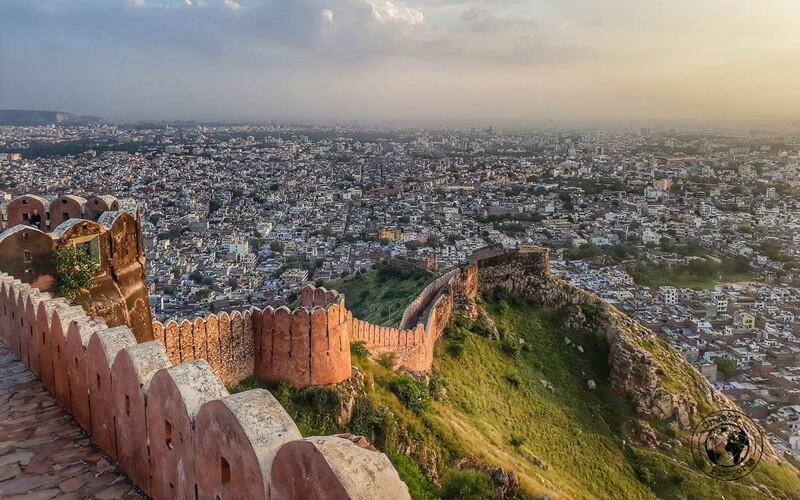 Many of the tourist places in Jaipur are found within the walled city area, although the city’s stunning forts are located outside the city center. Having trouble booking flights to the Jaipur? Choose Kiwi! Book your Train or Bus tickets in India online using a foreign credit card with 12Go Asia. Jaipur is very well connected by train to many parts of India including Delhi and Agra, where most of the influx comes from. It is wise to buy train tickets to Jaipur beforehand since seats tend to fill up quickly, seeing that it is so popular. You can get tickets on the IRCTC website or app, but registration is complex and may or may not work well (in our case it only worked the second time around). An easier alternative is to book your ticket from the 12Go Asia‘s website, which although comes at a slight premium, is way more convenient and easier to use, and accepts foreign credit cards without a hitch. Alternatively, you may also decide to book a private transfer for this route (like we did), since besides visiting the tourist places in Jaipur, there were a couple of stops we wanted to make along the way, to other attractions located on the Agra – Jaipur route. The cost of a cab (with Hippo Cabs) from Agra to Jaipur was of Rs 4017 (about €50) including a one hour waiting time at each of the two stops (Fatehpur Sikri and the Chand Baori Stepwell – see below for details about these two sites). We found Hippo Cabs to be very reliable. They answered our queries promptly upon booking, and we were sent a confirmation email and SMS just after booking. Two hours before commencing the journey, we were sent an SMS with the diver’s name and phone number. The driver was great and provided great service. The Jaipur composite ticket is a very convenient and affordable way of visiting many of the tourist places in Jaipur. The composite ticket costs Rs 1000 (about €12.25) for foreigners and Rs 300 (about €3.70) for Indians, and includes entry to eight of the most popular tourist places in Jaipur. Buying the Jaipur composite ticket works out cheaper than paying for the sites separately. On the other hand, if you’re only looking at visiting one or two sites, it would be cheaper to pay for each site separately. The Jaipur composite ticket is valid for two consecutive days and a hole is punched on the ticket next to the name of the site you are visiting upon your entry to that site. This ticket may be purchased at the main sites, primarily the Jantar Mantar or the Hawa Mahal, which are both conveniently located in the center of Jaipur. Here’s a list of tourist places in Jaipur included in the Jaipur composite ticket. We did not include the actual (separate) entry fees for Indian nationals in our post since they tend to be a fraction of the cost of what foreigners are charged. The ticket may also be purchased in advance and delivered to your hotel from Viator at a small premium. Related: Read our tips for visiting the Taj Mahal at Sunrise! Very similar to the one in Delhi, The Jantar Mantar is one of the top tourist places in Jaipur and can get rather crowded. Early morning is the best time to visit, since the unshaded area tends to get really hot in the afternoon. The game of shadows played by the exhibits is also best experienced when the sun is not overhead, thus noon is best avoided. 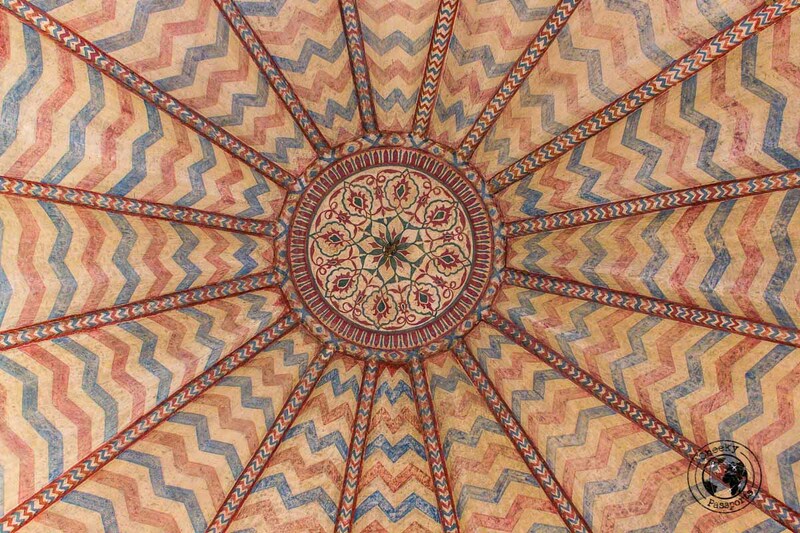 The observatory was constructed by Maharaja Sawai Jai Singh who was very interested in astronomy. 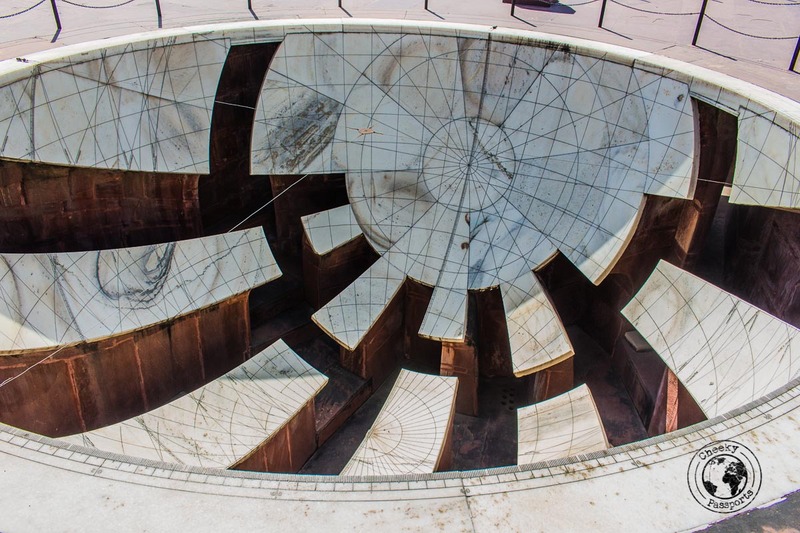 The Jaipur observatory is the biggest of the five he constructed and contains nineteen architectural astronomical instruments, amongst which is world’s biggest stone sundial. It is UNESCO World heritage site. Entry Fee – Rs 200 (about €2.45) for foreigners, but part of the composite ticket. Alternatively, have a look at pre-planned package tours here. Easily one of our favorite tourist places in Jaipur, the majestic Amer Fort should not be missed. 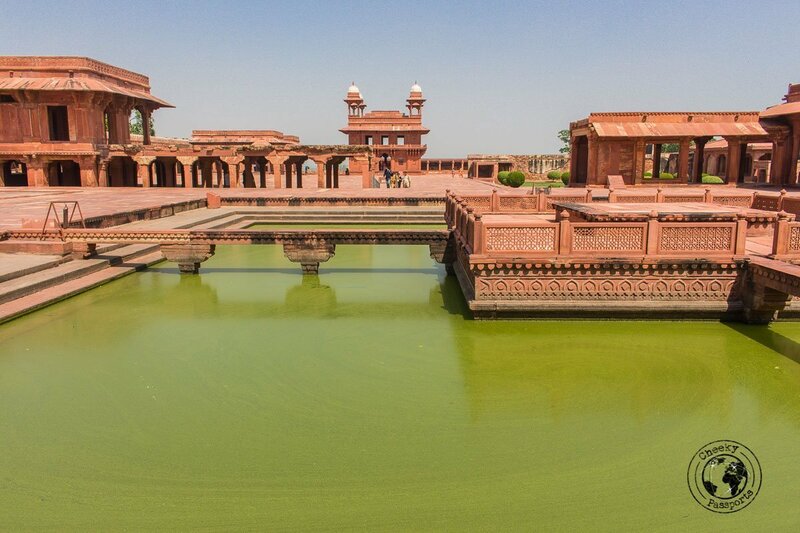 The massive architectural marvel, constructed of red sandstone and marble, overlooks Maota Lake and is home to several impressive courtyards, gardens, a temple, a palace of mirrors and of course gates. We got to Amer fort by calling an Uber cab from our hotel (which was located out of Jaipur’s walled city), for a cost of Rs 220 (about €2.70) to the fort. It’s an uphill walk to the main entrance. Elephant rides to the top are available here, but you should know that the elephants are subject to abuse, and elephant rides should definitely not be endorsed! It’s really not that difficult to walk up! Speaking about animals, you should mind the crocodiles in the lake (there’s a warning sign), though we have to say we did not see any ourselves! After you’re done visiting the maze of corridors of the fort, and time permitting, you may also wish to stroll down (out of the fort grounds) to the adjoining town. Make sure to visit the Sri Jagat Siromani Temple and its intricate stone carvings, and also the Amer Step Well, which although not as majestic as the Chand Baori (read on) also provides for some nice photo opportunities. Entry to both is free. Entry Fee – Rs 500 (about €6.10) for foreigners, but part of the composite ticket. Alternatively, have a look at pre-planned package tours here. 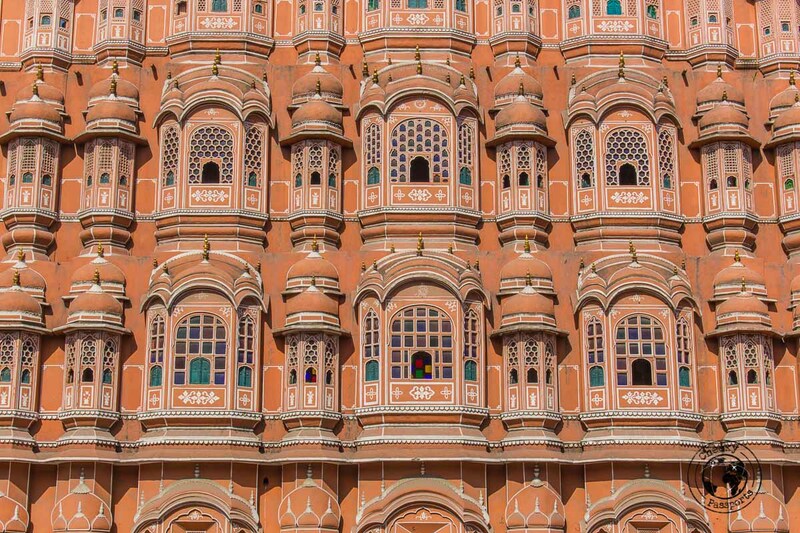 We noticed that many foreigners simply got a picture of the iconic Hawa Mahal from the outside and just moved on. 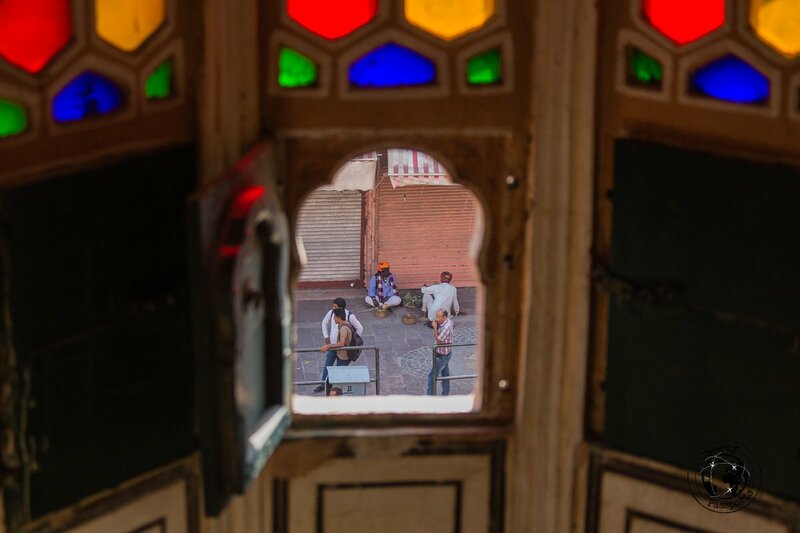 We do believe that taking a look inside the palace can give a better insight into Jaipur’s magnificent history. The Palace of the Winds is so called because it is always windy inside, due of course to the numerous little windows decorating the building, which were used to allow the ladies of the royal family to observe (called snooping nowadays) what was taking place in the streets below the palace, without being seen themselves. Indeed, it is very easy to imagine how this happened when exploring the nooks and crannies of the Hawa Mahal! We only visited the museum because it was included in the composite ticket but we’re so glad not to have missed out on it! We do not visit museums that often, but we found the collection of different artefacts from around the world very intriguing, although rather dusty and unkept. The jewel in the crown of the museum is a real Egyptian mummy kept in a climate controlled room in the basement! 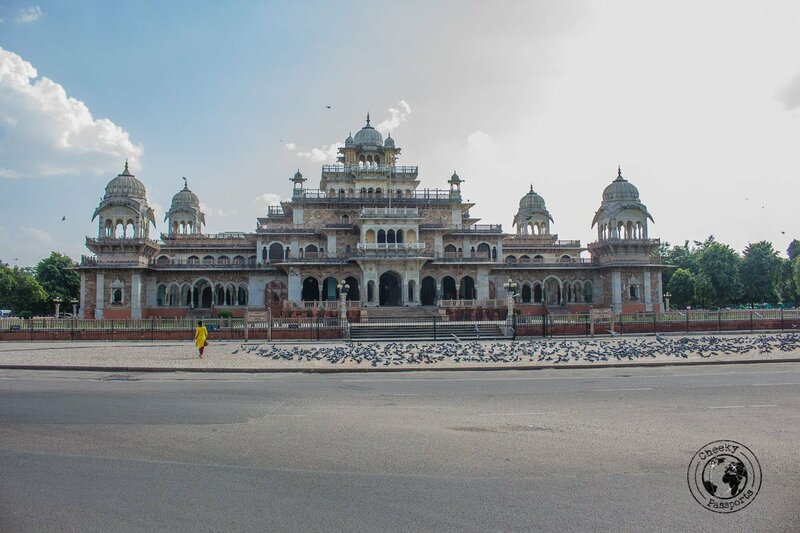 The architecture of the Albert Hall Museum also makes it one of the most popular tourist places in Jaipur. The structure was designed by a British architect, Sir Samuel Swinton Jacob and combines Islamic architecture with neo-gothic styles, making for an interesting mix. Entry Fee – Rs 150 (about €1.85) for foreigners, but part of the composite ticket. Alternatively, have a look at pre-planned package tours here. 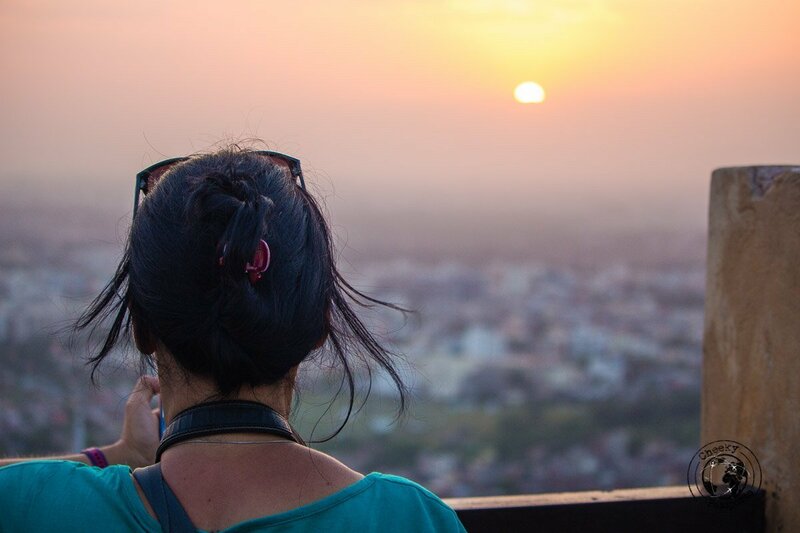 The view of Jaipur from the top of Nahargarh Fort, perched high on the hills above the city, is like no other – be sure to put the fort on your list of tourist places in Jaipur! 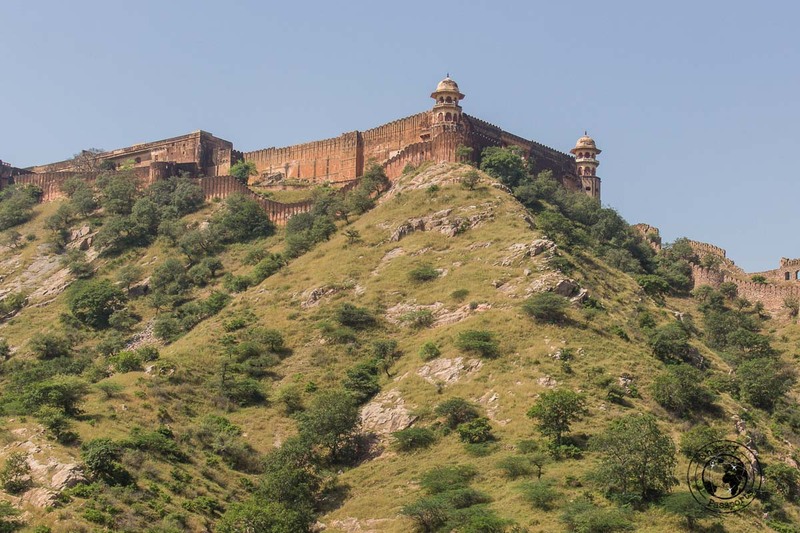 You can get to the fort by taking a tuk tuk to the top of the fort from Jaipur walled city or by walking up the steep steps to the top of the fort. Be warned though, you do need to be moderately fit to undertake this exercise! We visited Nahargarh just after Amer Palace, and a tuk tuk ride between the two cost us Rs 200 (about €2.45), with lots of complaining from the driver because the hill up to the fort is steep. We made it just in time for a quick look around before sunset, after the Heritage Water Walking Tour (read on). The fort is not particularly large (compared to other forts in India) and there’s no need to allocate more than 30 – 60 minutes to view the most interesting parts. The sunset spot is located a short walk to the west of the main building, past Padao Restaurant. The restaurant apparently boasts a great sunset spot too, but you need to pay to enter the premises. Being accustomed to spectacular sunsets over the water in our home country, we didn’t find this sunset to be particularly mesmerizing, but the colours of the fort at golden hour are quite splendid! We walked down the steep slope to Jaipur City after watching sunset from the fort. This minaret at the centre of the Pink City, also referred to as the Tower to Heaven, provides 360 degree views over Jaipur City and is within walking distance of the Jantar Mantar and Hawa Mahal. The monument is of historical importance and there’s not much else besides the steep climb to the view, but we recommend including it on your list of tourist places in Jaipur if you want to get an aerial view of the city! Entry Fee – Rs 70 (about €0.85), but part of the composite ticket. We didn’t have time to visit these two gardens, but, judging by the pictures, they would be great places to spend a few relaxing hours in, if you can afford the time! Entry Fee – Sisodiarani Bagh – Rs 200 (about €2.45) for foreigners, but part of the composite ticket; no entry fee for Vidhiyadhar Bagh. Our friend Arv introduced us to a hole in the wall place on the main road inside the walled city – it was the only place open at 8.30am and seemed to be very popular with the locals. We can easily confirm that the chai served there is some of the best we’ve had! Try to find the same spot located near the north-western corner of the Golcha Cinema! 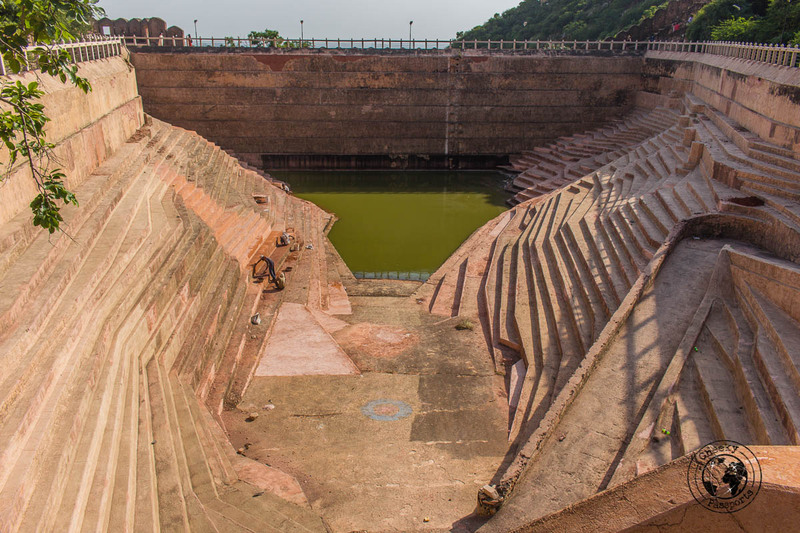 We are so glad to have had this off-beat experience in Jaipur with Heritage Water Walks! Neeraj, the engaging registani (a person from the desert) behind this initiative took us on a two-hour walk around Nahargarh Fort to explain all about the importance of water in Rajasthan. He delivered a huge amount of very interesting information related to the hydrology of the site, via the art of story-telling which made the experience all the more intriguing. It would be a pity to visit Rajasthan without realizing how precious the commodity many of us take for granted is to the people living in the desert, and how they have managed to harness water through the centuries. The sacredness of water has had a huge impact on Rajasthani culture and Neeraj’s water stories are as entertaining as they are informative. Neeraj conducts a similar walk around Amer Palace. 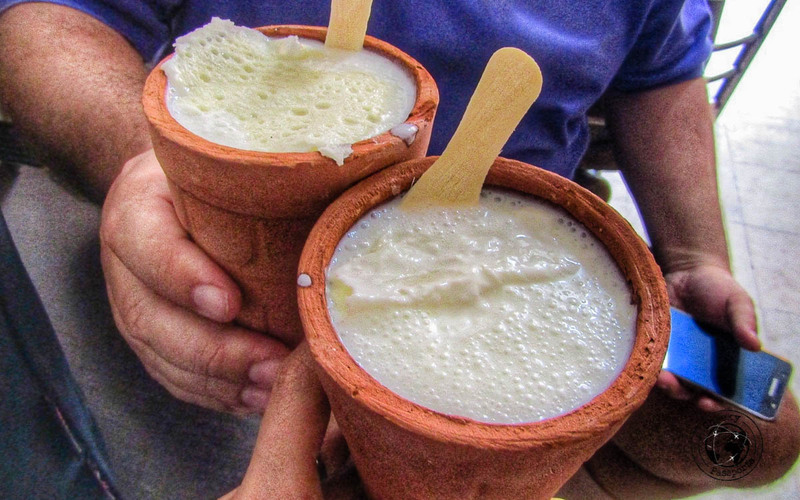 Jaipur is home to some great Lassiwalas serving up the refreshing drink in clay vessels. There are many located close to each other, outside of the walled city, all claiming to be the best Lassiwala in Jaipur and we didn’t quite figure out which one of these is the ‘famous’ outlet, but the one we went to was pretty good! Cost – about Rs 60 (about €0.75) for a large cup; Check the location on the map. This palace complex was the seat of the Maharaja of Jaipur and is easily one of the best tourist places to visit in Jaipur. Unfortunately, it is not part of the composite ticket and the entrance fee needs to be paid for separately. 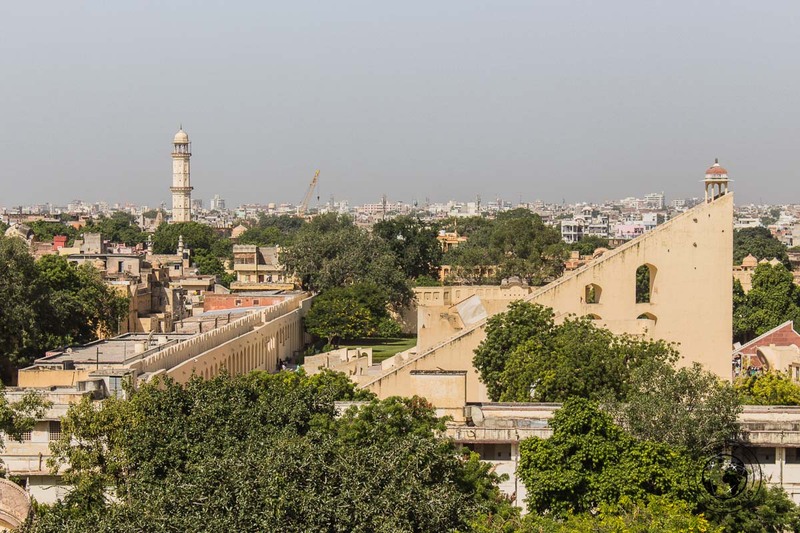 The complex houses many courtyards and gardens, as well as buildings including the seven-storied Chandra Mahal, the Mubarak Mahal and the City Palace Museum. Visitors can enter the complex through the Virendra Pol and the Udai Pol. Entry Fee – various ticket options starting from Rs 400 (about €4.90) for foreigners. Alternatively, have a look at pre-planned package tours here. 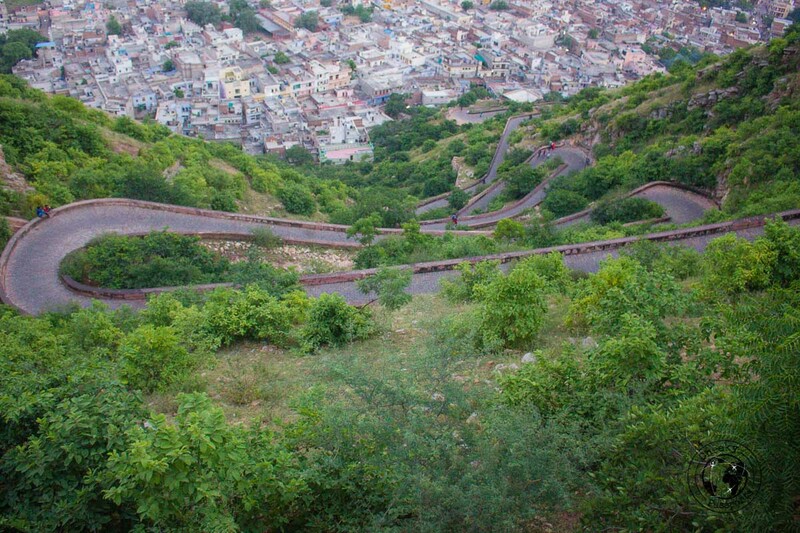 Galti Ji is perhaps one of the most fascinating tourist places in Jaipur. 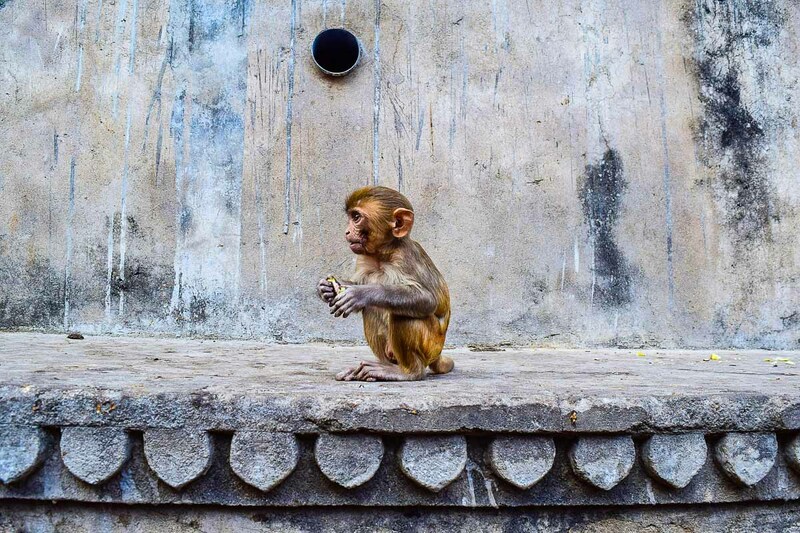 The group of temples situated in a valley outside of Jaipur are so called because of the myriads of monkeys that have made the temples their home. You can get there by private car, but you can also get a tuk tuk to Galta Gate and walk up a hill to the Temple of the Sun to view Jaipur from above. From there the road descends to Galta Ji. The temples contain tanks in which devotees bathe in what are believed to be sacred waters. The area is really very scenic, with great views from the higher floors of the temple! Entry Fee – none. Alternatively, have a look at pre-planned package tours here. Jaigarh Fort, built in the 18th century, was built to protect Jaipur and Amer Palace and in fact contains subterranean passages leading to the latter. It houses the world’s largest canon on wheels and was never conquered in battle. This fort should make it to your list of tourist places in Jaipur for the spectacular views of the city and the surrounding areas! Entry Fee – Rs 85 (about €1.05) for foreigners. Alternatively, have a look at pre-planned package tours here. Two fascinating places of interest are located in the Agra – Jaipur route, so much so as to justify the added cost for a private transfer. We strongly recommend you visit them if you can spare the time and money for the journey! This massive UNESCO World heritage Site, designed and constructed in red sandstone, is located 37 km away from Agra and can easily be visited if you are traveling from Agra to Jaipur via private transport. The ancient city, surrounded by three walls and a lake, is home to a number of remarkable structures and monuments – do not miss out on this attraction, especially if you are fascinated by ancient history and architecture! The site can also be visited as a day trip from Agra. The complex can easily be visited without a guide, if you have some knowledge of history and architecture. We did not feel the need to hire one. Once the transport drops you off in the parking area, you need to walk to a bus which will drop you off in the monuments area. The bus costs Rs 10 (about €0.12) per person. There’s a beautiful mosque just outside the monuments back area, which is unfortunately the subject of lots of scams. Touts outside the mosque will tell you that you can pay them to sort out your entry fees and shoe fees. You should know that there are no such fees at all, and that you do not need to pay anyone a single rupee. You can carry your shoes in a bag or in your hand once inside. There are also lots of sellers within the mosque grounds who will bother you to try sell you stuff. Do not look at them unless you really wish to purchase their goods and walk straight ahead until the sellers and touts stop bothering you. Also, you should stop anyone who will come up to you and start explaining any historical facts about the site and complex. They will ask for money unless you stop them earlier on. Basically, just ignore everyone who comes up to you and you’ll be fine! A bus just outside the mosque will take you back to the parking lot for a further Rs 10 (about €0.12). Entry Fee – Rs 610 (about €7.55) for foreigners. Alternatively, have a look at pre-planned package tours departing from Agra here. Batman fans will surely recognize this ancient stepwell from the move The Dark Knight Rises. Indeed, this was the reason why Nikki was so determined to visit Chand Baori located in the village of Abhaneri, on our travels to India. 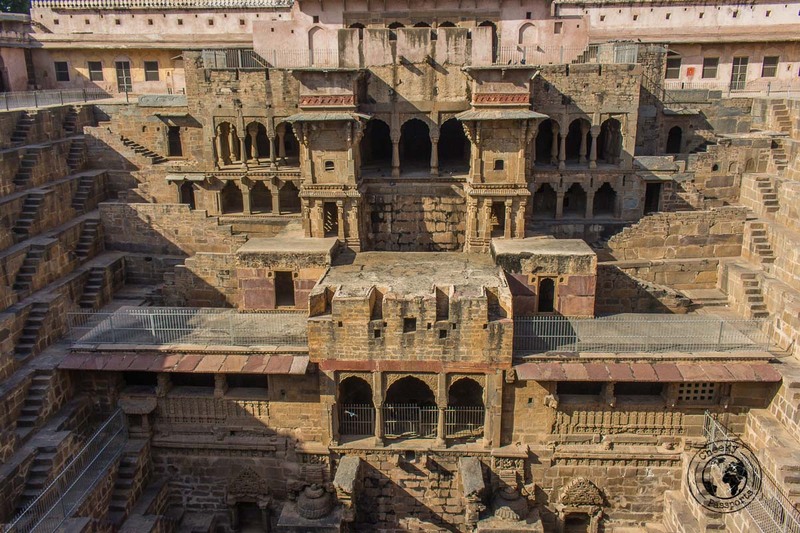 The Chand Baori stepwell is one of the largest and deepest amongst hundreds of stepwells in the Rajasthan area. It was used to conserve and store water in the arid climate and was also used for public bathing. The stepwell consists of over 3,500 steps, over 13 stories leading to the bottom. Since the stepwell is much cooler at the bottom than it is at the top, it was also used by locals as a meeting place during very hot periods. The stepwell is easily one of the most fascinating places we have been to in Rajasthan – be sure to include it on your list of places to visit! Entry Fee – free. Alternatively, have a look at pre-planned package tours here. We stayed at the Umaid Mahal and we cannot recommend it enough. It is not a budget hotel, but provides very good value for money if you feel like treating yourself to some affordable luxury! 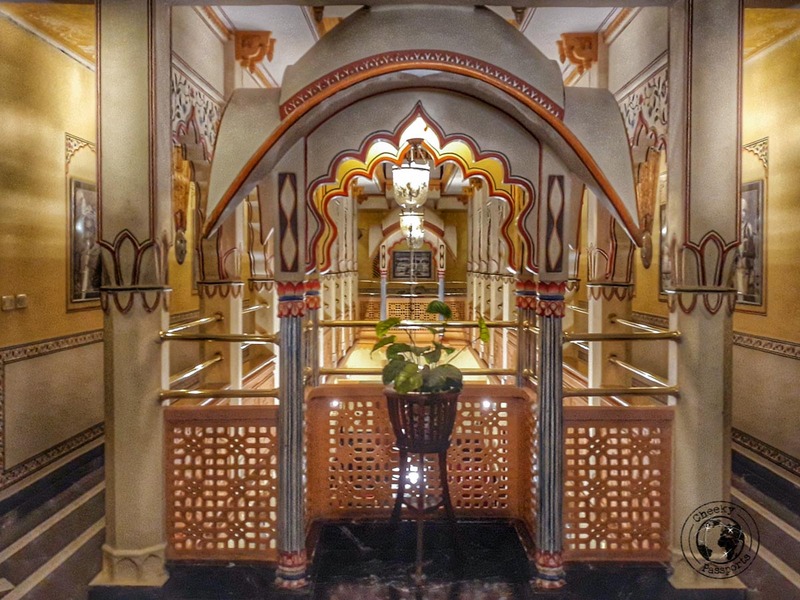 For those looking for accommodation on a lower budget, the Backpacker Panda Stephels is well-reviewed, whilst the Resort Khas Bagh seems like a great choice for those traveling on a luxury budget! 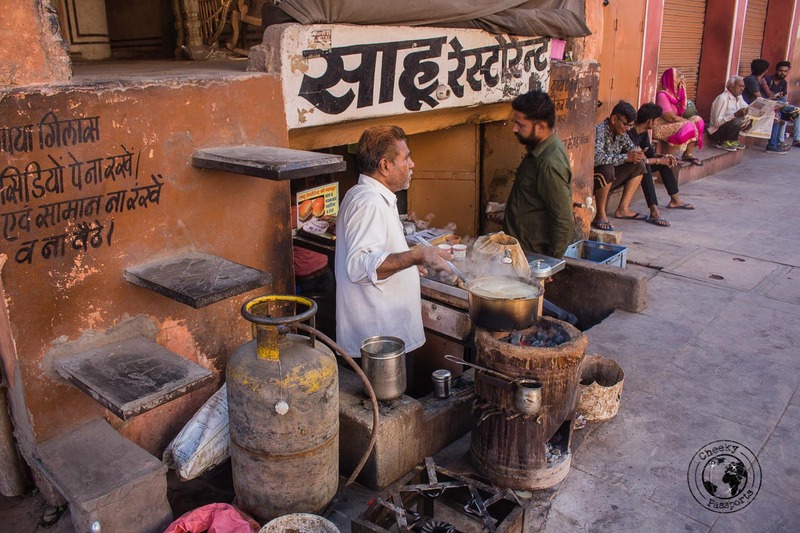 Jaipur is home to several restaurants, but our favorite local eateries were those located just outside the train station and the bus station. 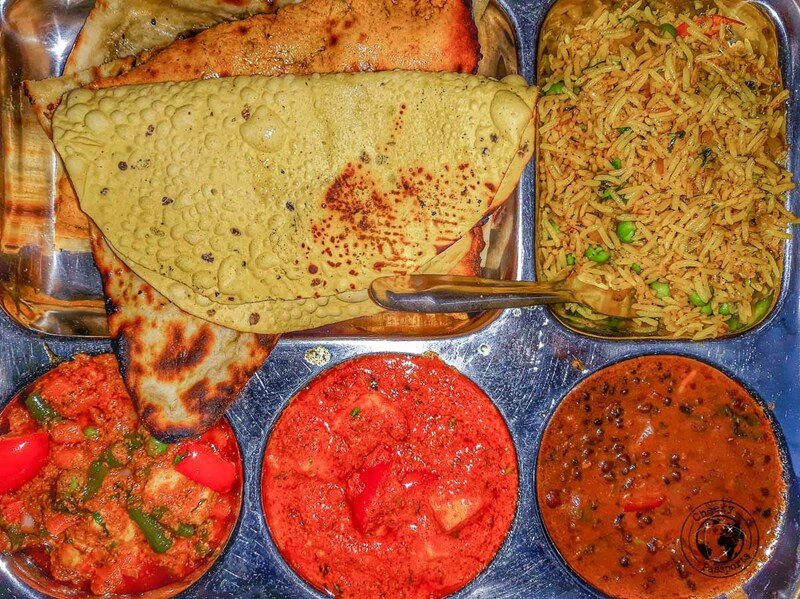 These local joints are cheap and can be rather dirty, but we thought that the food served there was very authentic and budget-friendly! If you’d like something more upmarket, Tea Tradition serves great chai, coffee and snacks! Let us introduce you to our friend and fellow blogger Arv who lives in Jaipur and runs a blog focusing only on his hometown. 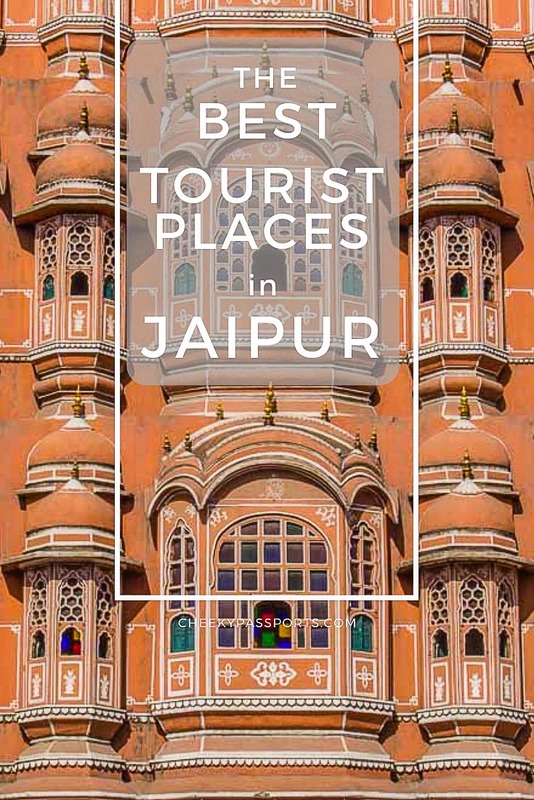 He’s got some detailed articles about off the beaten path things to do, and other tourist places in Jaipur, and provides great insight into some of the attractions. Check his posts out at Jaipur Thru My Lens. Excellent resource for those travelling to the Pink City! Your narrative is simple and easy to understand with many personal experiences to vouch for its reliability. 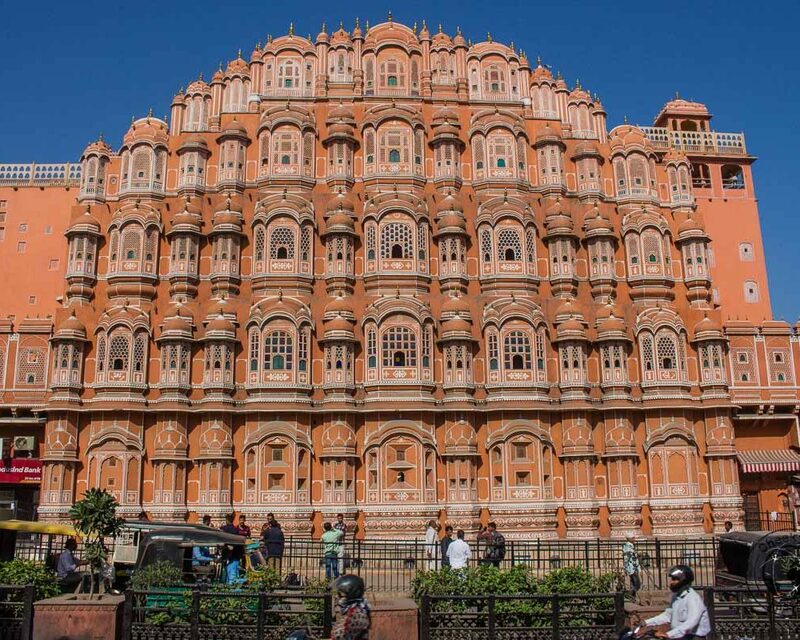 Its a great guide for a 2-3 day Jaipur trip. Thanks for the mention, Michelle and Nikky! Great pictures! I really loved the food and chai shots, as well as the one of the little monkey, haha. 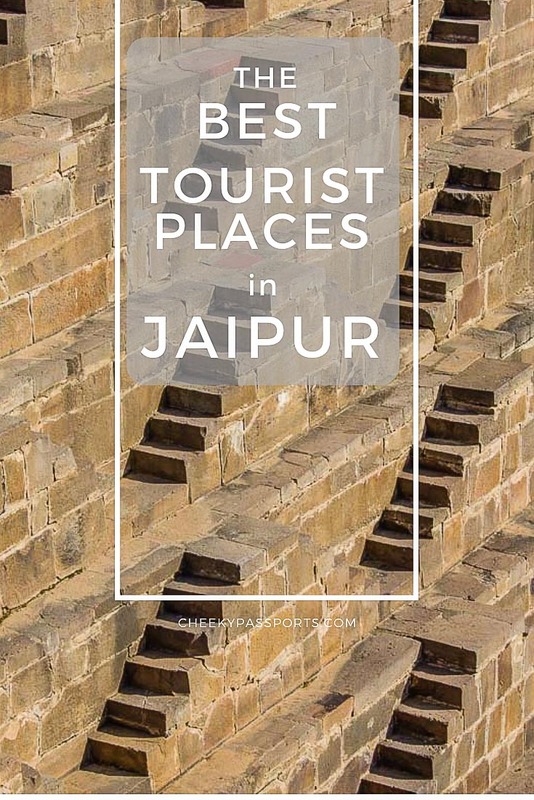 These are some great recommendations… I wish I’d seen this before I went to Jaipur! I visited some of these places, but not nearly enough. 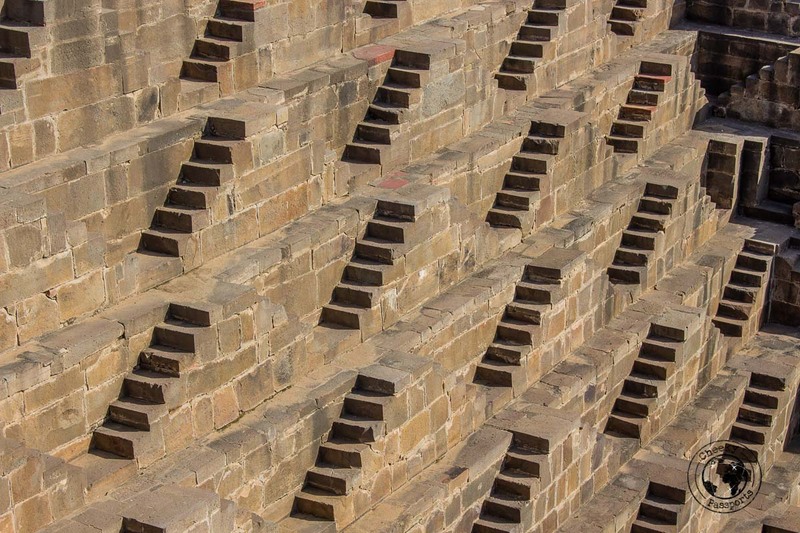 For example, I missed out on seeing the Chand Baori Stepwell… a pity! Nathan, perhaps that just means that you need to travel to Jaipur again! 🙂 Glad you liked our pictures! Excellent resource for those traveling to the Pink City! Your narrative is simple and easy to understand with many personal experiences to vouch for its reliability. Its a great guide for a Jaipur trip. Thank you for posting this article.